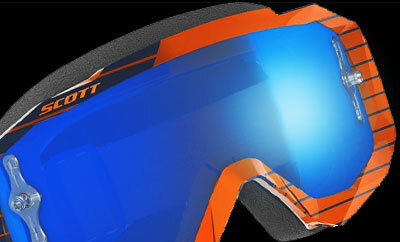 Scott is constantly working on the development and improvement of motocross goggles. One result of the constant innovation is the Scott Hustle. 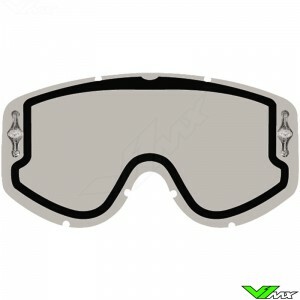 This ultra-light motocross goggle is widely used by professional riders. The Hustle motocross goggle is packed with technical features that enhance the comfort and performance of the rider. In the mid-price category, the Scott Hustle is available. The Hustle is a real competitive motocross goggle which is available with both clear and mirror lenses. 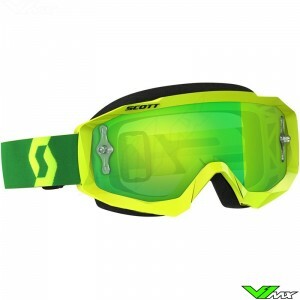 Due to the multiple layer facial foam and anti-fog treatment, these Scott motocross goggles offer excellent and unobstructed visibility. Below the most important features are further explained. The Frame is optimized to enhance comfort and field of view. 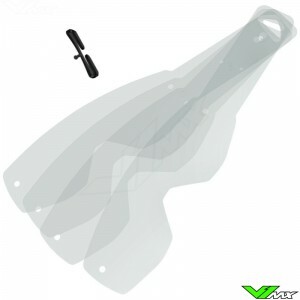 The frame is made of flexible plastic, which helps to create a good fit. Most modern helmets can be used with the Scott Hustle, due to its low profile. Another design aspect which helps the field of view is the curvature of the frame, this helps you see more in the corner of your eyes. The Scott Hustle has multiple layers face foam that works together to create a comfortable fit on your face. It has an absorbent layer to remove sweat. 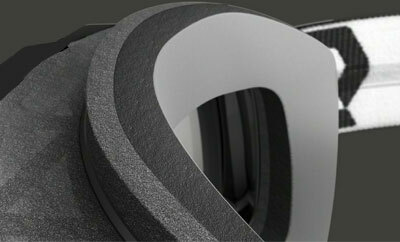 Another advantage of the foam is that it provides a perfect seal. Even if you get roosted in your face several times, no sand will penetrate the goggles. At the nose section the foam has a bent to exert minimum pressure on the nose, preventing the glasses from closing the nostrils. Lens technology is important for motocross goggles. The Scott Hustle has been equipped with Works lenses. 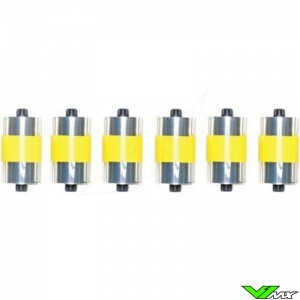 These lenses are suitable for mounting both tear-offs and a roll-off system. The lens has had an anti-condensation treatment to prevent fog from covering the glasses during riding. All Scott lenses have a low weight and block 100% of harmful UV rays. Works lenses are very strong, due to high quality materials and production techniques. 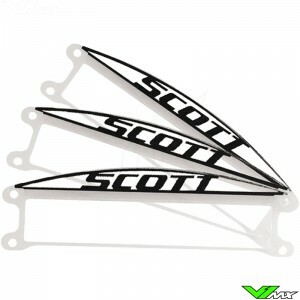 Several versions of the Scott Hustle are available at V1mx. 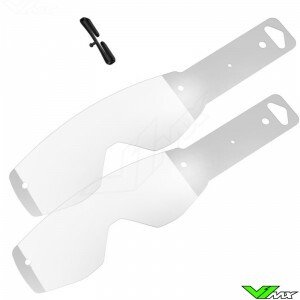 You can choose a clear lens for low light situations, but also motocross goggles with mirror lenses are available. The advantage of a mirror lens is that it blocks more light, so you won’t get blinded by the sun. The Scott Hustle is produced in many variants for various disciplines of off-road racing. The main models are explained below. The Hustle X is an affordable version of the Scott Hustle line-up. It has all the high end features of the standard Scott Hustle, only the face foam is different. The face foam of the Hustle X is made from two layers. The Hustle MX has 3 layers of face foam and the versions chrome lenses are supplied with an extra clear lens. The Scott Hustle MX is also available with pre-installed light sensitive lens. The light sensitive lens reacts to light changes and within seconds it will get darker when the sunlight gets stronger. The Hustle WFS is designed to tackle the most hectic and though race conditions. With the Scott Hustle WFS goggle you will get a full roll-off system with roll-off canisters, anti-stick grid with mudflap and even 2 rolls of films. The full system is pre-installed, allowing you to use it straight out of the box. The Roll-off system can also be bought separately. The Scott Hustle Sand version has all the exceptional features of the Hustle X motocross goggles. The difference with the normal version is the face foam. It is made specifically to prevent fine sand and dust from entering the goggles. This assurance combined with tinted lens, full UV protection and comfortable multilayer face foam, make these goggles perfect for rides in dry sand during the summer or desert specific races such as Dakar. For enduro riders Scott produces the Scott Hustle X Enduro. This enduro goggle is equipped with the ventilated double ACS lens which ensure high performance. 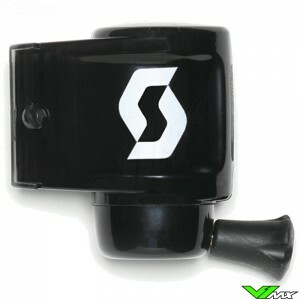 ACS stands for Air Control System and ensure high performance to enduro riders. 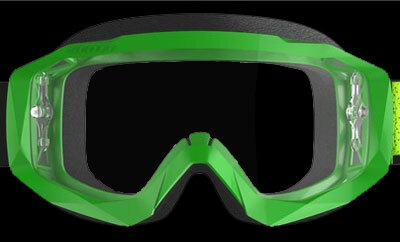 This goggle is perfect for extreme riding conditions where temperatures range from very high to very low. The Scott Hustle Enduro is also available with pre-installed light sensitive lens. The light sensitive lens reacts to light changes and within seconds it will get darker when the sunlight gets stronger. 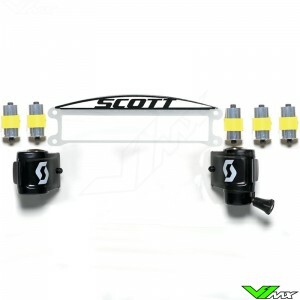 Scott is known for having a wide variety of colors available. 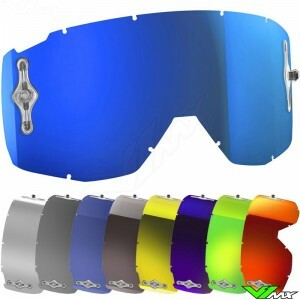 Are you looking for a specific color, such as black motocross goggles or blue mx goggles? Then you are in the right place at V1mx. We offer many brands and types, so there is always a design that fits your style. Do you have questions about the Scott Hustle? Feel free to contact us. We will be happy to assist you choosing the right motocross gear. 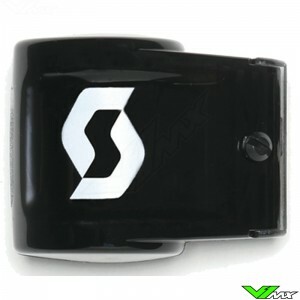 There is always a product that meets your requirements, due to the wide range of motocross goggles.